Hello everybody! I'm so glad that you stopped by to visit. I truly appreciate your time. I want you to share your comments with me. I just love hearing from you. Please remember that in the history section of my post come from various places. I research history, type the post and pass the history on to you. If you find an error in the history section of my post, someone gave me wrong info, then I pass it on. I read all comments and emails. I don't always have the time to respond to every comment or email. If you have a question and leave a comment, please come back to get your answer. If you find an error. have a complaint or have a question, please send me an email at christinespantry@gmail.com. Any comments that contain links, spam, hate speech, inappropriate will not be published. I encourage you to share my post, recipes and photos, please do not take them and use them as your own. Feel free to excerpt and link, just give credit and send folks to my website, christinespantry.com. Do not watermark my photos. All post, recipes, photos and articles belong to Christine's Pantry unless otherwise noted. Folks using properties of Christine's Pantry for their own reasons will receive an email for removal or ask to link back to Christine's Pantry. If you do not remove or link back to Christine's Pantry you will be reported of use for copyright infringement. Beef stew is a wonderful comfort food. I love, love my mom's recipe. I saw this recipe while I was on Betty Crocker website. So I thought I would give it a try. Glad I did, my family loved this. There's a lot of great recipes on that site. My mom's recipe took a few hours to cook. This version takes 30 minutes to cook. Great weeknight meal the family will love. It's easy and tasty. So good. My mom's recipe is still the best, that's my thoughts. I think, a great stew must always have beef, potatoes and carrots. This recipe has those ingredients plus mushrooms. The spicy mustard adds a lot of flavor to the gravy in this stew. The leftover taste even better the next day. 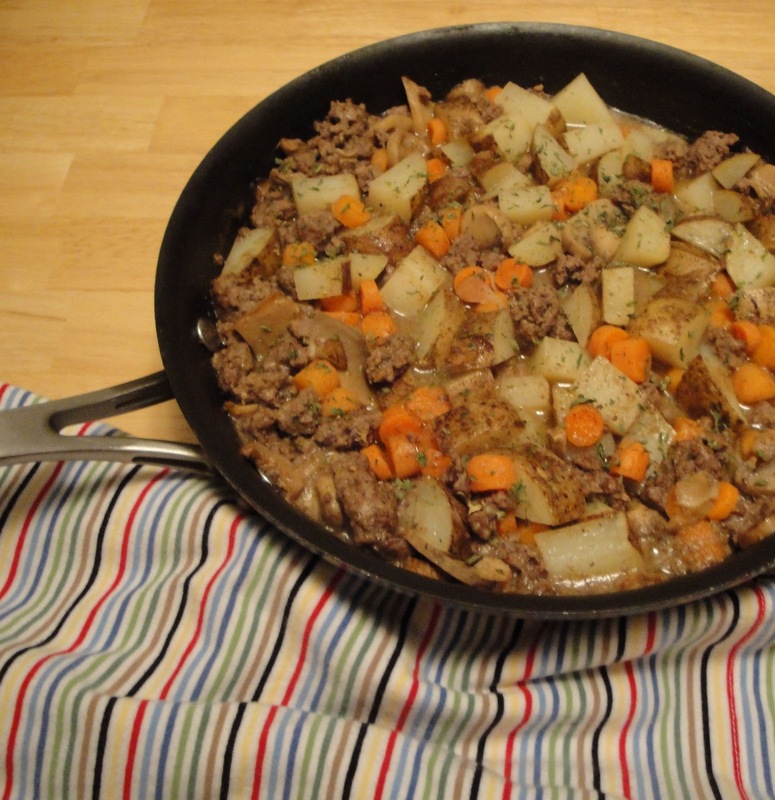 In 12 inch skillet, over medium heat, place ground beef in skillet and Worcestershire sauce, cook about 5 to 7 minutes, stirring occasionally, until no longer pink. Drain. Stir in salt, pepper and flour. Add mushrooms, cook for 3 minutes, stirring occasionally. Add beef broth and mustard to beef mixture. Stir in potatoes and carrots. Reduce heat to medium low, cover, cook for 15 minutes, until vegetables are tender and sauce is slightly thicken. Sprinkle with parsley. Enjoy! Cooks note: If sauce is to thin at the end of cooking process, increase heat to medium high and cook uncovered another few minutes until the liquid reduces and slightly thickened. Love this recipe !!! Btw did you notice anyone trying to steal your recipes? Because I saw couple of mine on one blog, no names though. Sounds delicious Christine. I love beef stew but beyond the time it takes, the meat is so darn expensive! This sounds like a great way to get past that problem. Definitely bookmarking this. Yes, I did notice my photo and recipe on a blog. The stew looks hearty and tasty! Ah, what a great variation! What a classic--my mother gave me a Betty Croker cookbook when I went off to college, and I still have it, although it's splattered all to heck with flour and the remnants of various recipes. Its sad that people steal things without permission. Stew is my favorite. Mmmmmmm, it's rainy and cold here. I sense some comfort food in my future! So sad that some people don't have a conscience! Keep on sharing your lovely recipes anyway :-) I like this stew a lot, and I'll probably use ground turkey to do it since beef isn't something I have often. Sounds and looks lovely!